I feel like today was a day for womanhood. When I arrived at school the headmaster spoke to Carlie and I before we went into our classroom to teach. He asked what I was studying. After learning that I was focusing some of my education and work experience specifically with young women, he asked, "Why women?" That was a valid question, and one that I have asked myself many times over the past few years. What is it that draws me to work and spend my time with the young women of this world? Having grown up with three brothers and no sisters in the house, one might think I would find a natural inclination towards, and understanding for young men rather than young women. Or, people often joke that it is because I grew up with three brothers that I 'turned away' from working with boys, hoping girls might be easier. The headmaster himself jokingly said, "What is it we (men) have done to you to make you choose girls?!" He's so funny. I love my brothers so much, but not enough to give them all the credit for that big of a decision.....maybe just some! Whatever it was or is that draws me to work with young women, I continually find happiness and a sense of peace when I interact with the AMAZING women of this world. Today, our group traveled again to Manya Krobo to teach an HIV/AIDS lesson. This week we are working with a young women's organization. A woman and her husband have organized this group for the teaching and bettering of Ghanaian women. They have each made their own blue uniform dress and gave me a loud round of applause when Lynley pointed out that I, too, love to sew. That was so fun for me. I had a moment today as I was sitting outside interviewing one of the young women when I just felt such peace, and again, was reassured that my time spent with the young women of the world will be a blessing in my life and, I pray, a blessing to theirs. I feel blessed to seem to have such an innate connection to the hearts of young girls and an immediate love for who they are and what they can become. The lives of the people in Africa are not easy. 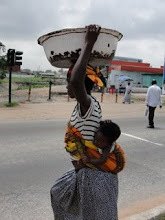 Women are not spared from the hardships, and in many instances, are given great burdens to carry because of their womanhood. Respect for the beauty and divine nature of women seems in short supply. Expectations of hard labor and sacrifices, different to those of other more fortunate countries, are given to the women here. I have seen more than once an elderly woman, well over the age where rest and comfort should be afforded, walking the streets with a large basket on her head, wearing a dirty dress or skirt with a face full of weary. I think of my own grandparents and how their bodies no longer carry the same vitality they once did. I just wonder how it would be to spend a life of 80 years living everyday in a country like Ghana. Like mama always says, "We all have just one earth life. Think of all the different ways those lives are spent around the world!" Something I think most people can enjoy is a beautiful African spiritual, with no accompaniment and simple harmony. The girls sang us a few songs before we began and it was beautiful. I pray the lives of these young women will be safe, and that one day they will be supported by men in their lives who will honor them for their strength, beauty and potential. What a beautiful entry, and I love the woman who without hands carries that basket. The Lord has truly blessed black people, they have the most beautiful voices. "The years tell us much that the days never knew." (Emerson) Your "years" are showing. Enjoyed this very much. You know all the boy secrets, that's what qualifies you to work with girls. Did you hear Sister Dalton's talk from this past conference? (That was an amazing one, by the way--you must read or re-read it asap. Heck, I must re-read it asap. So good.) Anyway, I laughed outloud when she said that she's qualified to be the General YW president because she knows all the boys' secrets. Seriously, though, you're sense of purpose is very inspiring, Annie. I am inspired evey time I read of your experience of the day. You truly know how to capture the heart and essence of the people. I loved your mom's thought by Emerson. So true!